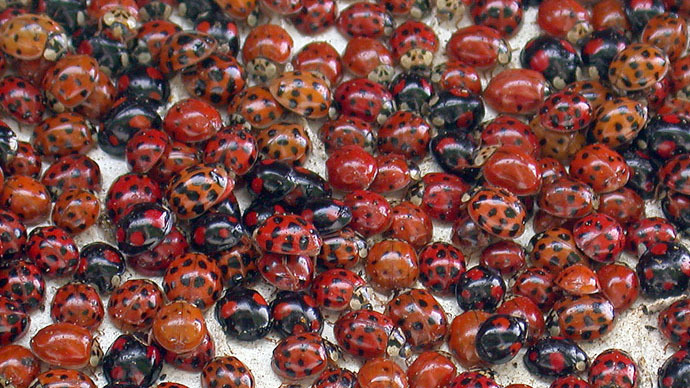 Seven Maryland high school students are facing burglary and other charges for allegedly breaking into their high school and releasing thousands of ladybugs as part of a senior prank. According to the St. Mary's County, Maryland Sheriff's Department, five male suspects wearing masks and hooded sweatshirts forced their way into the Chopticon High School at around 3:40 a.m. on May 20 and released approximately 72,000 ladybugs purchased over the internet. Two male suspects waited outside in a car while the others entered the school. Four juvenile suspects are being charged with fourth-degree burglary, property destruction under $1,000, and disruption of school activities, the sheriff's office reported. They were released into custody of their parents. The three other adult suspects will be charged through criminal summons. Chopticon is acting ridiculous about this harmless ladybug senior prank. Pressing charges and giving those kids a record is messed up. Chopticon students said the senior class prank was funded by about 75 students in order to purchase ladybugs at a total of $100. "Everyone was obviously laughing the next morning because it was so unique," senior Eric Maxey, who was not present during the prank, told ABC News. "It didn't cause any damage and the school had already bagged up most of them by our second period." Students at Chopticon have organized protests and circulated an online petition after school officials said one prankster would not walk at graduation. "The tradition of senior pranks has been around for years," the online petition reads. "Many senior pranks result in permanent destruction and thousands of dollars in damage, this prank however, was not the case. The lady bugs did not hurt anyone, and were cleared from the school in a day. Yet [the student] still can't walk. This is a clearly unreasonable punishment from the administration and must be over turned."